There's really only one tech story of note this week - the rise and fall of the country's CTO, a role which hasn't even been filled yet. The CTO role was initially mooted by Rod Drury who, presumably fed up with government departments not buying his product, suggested we have a chief technology officer who would "identify big issues and own a national strategy". 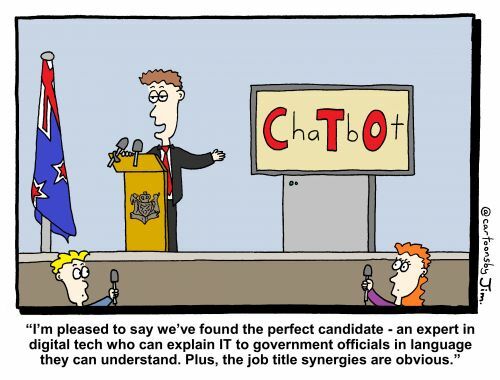 That was in 2014 and it possibly came as a surprise to many to discover New Zealand already had a CTO, a hands-on role that existed within the Department of Internal Affairs and which oversaw government departments and their IT needs. Tim Occleshaw, along with chief information officer Colin MacDonald, were already doing the practical day-to-day stuff. But that's not the role Drury saw. He wanted to match the US "digital czar" model with someone who could "apply technology to create jobs, reduce the cost of health care, help keep the nation secure and increase access to broadband". In 2014 these were key issues as the country moved through the final stages of the National Party's government and both National and Labour were jockeying for position in the lead up to the election. Drury quite rightly pointed out that our IT infrastructure was often at odds with itself, was often uncoordinated with other activities and was always treated as a second-class citizen, despite the opportunity that presented itself to New Zealand as a whole. Get it right, and we could build an industry at least as strong as the dairy sector is today. Get it wrong and we could end up as a farm and a tourist destination and we should all learn how to say "would you like fries with that". The idea bounced around for a while and something similar ended up as the core recommendation of the 2017 Tech Manifesto from ITP, NZTech, InternetNZ and a range of other tech bodies. It was in the form of a "Ministry of the Future" - basically a CTO with resources, and the manifesto also refined and identified the range of areas a CTO needed to focus on to set up NZ's digital future. Both political parties leapt on the bandwagon and both announced they would support the implementation of a national CTO who would lead the industry, and the country, out of the tech wilderness. In 2017, National's economic development and communications minister at the time, one Simon Bridges, told Stuff that he was "considering the establishment of a chief technology officer-led think tank" and Labour claimed it had always wanted to have a CTO and would establish a position that would "report directly to the Prime Minister and Cabinet". Labour won the election, catching many (some would say even themselves) by surprise when Winston Peters brought New Zealand First into coalition with Jacinda Ardern's party and the rest is history. A cabinet paper outlined the role and capability, a press release announced the government wanted someone in the role by February 2018 to take part in a multi-national meeting of digital nations, and it was full steam ahead for those who wanted to put their hands up. At that point, however, the job began to drift somewhat. The CTO role as outlined in the cabinet paper would have responsibility with developing a government digital strategy, something that would have to be delivered almost immediately. The role was not fulfilled. A long-list of 60 was whittled down to a handful of only four for the short list and interviews were conducted, however none were deemed appropriate and the role was slightly reshaped in February this year. According to the Beehive website, the new role definition was all about digital matters. "The Chief Technology Officer will help develop a digital strategy for New Zealand, drive our digital agenda and respond to the opportunities and challenges of our changing digital world". The CTO would help plan for "future workforce needs and the development of new skills", would respond to "emerging and disruptive technologies" and ensure all our communities "are supported" to improve their digital access and equity. The cabinet paper that created the position gets into a little more detail. "[T]he Chief Technology Officer role be established as a broadly mandated independent advisor, in the form of a one-person Ministerial advisory group, which: will attract the kind of high profile person who is able to engage directly with ministers, chief executives, and other stakeholders across New Zealand; is able to work collaboratively with government to instigate, frame, and drive New Zealand's digital agenda; and provides a level of independent challenge to government and other stakeholders". That's quite an agenda for a one-person office and given the lack of support capability (analysts, policy personnel, advisors and so on) and with no ability to implement any recommendations, the role is high on expectation and low on actual achievability. The role calls for someone with a high profile, but who is not currently engaged in a role. Someone who can talk operationally to the government departments, but who also looks to the future and the issues that New Zealand faces. Someone who can engage with cabinet ministers, chief executives and other key stakeholders, but is also able to talk with the general public on matters ranging from new copyright laws to why there are no jobs once the robots take over, from the digital divide to privacy concerns to new sources of protein and their impact on the economy. It's no surprise that this unicorn is unlikely to be both available to do the job and willing to become a civil servant, albeit a well paid one, with no ability to actually drive through the change they need. Which leads to the current situation. Minister of Communications, and the lead on this project, Clare Curran, was forced to resign following a second meeting that wasn't recorded in her official diary. The first meeting, with Radio New Zealand's Carol Hirschfeld, resulted in RNZ bosses hotly denying the meeting was planned, but which turned out to have been scheduled by Ms Curran. She was dressed down for this tardiness by the Prime Minister - Hirschfeld lost her job. The second meeting was in February 2018 and was with serial tech entrepreneur Derek Handley and was presumably about the CTO role. Because this meeting also was not recorded in her public diary, Curran resigned from her roles as Minister of Open Government and Digital Services and was demoted from Cabinet. The decision around the CTO role has passed to Minister of Education Chris Hipkins, and his press secretary told Stuff's Tom Pullar-Strecker that the minister's role is to run a "ruler over the process", leading to howls of anguish from the tech sector who see Handley as that most inappropriate of people - an entrepreneur with no CIO-level background who would be inappropriate to anoint as the country's digital czar. Whether that is indeed what the Minister is suggesting - that the decision has already been made - remains to be seen. Given the lack of announcement around the appointment to date, there would appear to be no rush, but if Handley has been offered the role he's likely to inherit a poisoned chalice and will find it hard if not impossible to regain any ground lost prior to his commencement date. The role itself is one that has generated a lot of noise. Do we really need a CTO or a tech kingpin as Drury framed it up? Some, such as tech commentator Ian Apperley, have suggested there's no pressing need for this visionary role. Others, this writer included, have said there is a need if only to explain to MPs and government officials what they need to know about technology and the impacts poor legislation have on the tech sector. You only have to look at New Zealand's copyright law debate or (more recently) Australia where legal minds decided technology wasn't going to stand in the way of a new law and who introduced encryption backdoor requirements that will break the apps that use encryption to see what can go wrong with a legislative body that doesn't get it. But is the role in its current form able to tackle those issues? It's doubtful, given its advisory role and its lack of authority. The role probably needs to be reshaped. We need a CIO or CTO to look after the government sector, but it's unlikely that anyone in an advisory-only capacity will be able to make any difference there at all. The model is broken in that different department heads are required to demonstrate that they have done due diligence and created the best possible contract and setting for any IT deployment and that typically involves hiring a big-name consultancy to come up with the plan (which no doubt includes buying hardware/software/services from one of the consultancy's main offerings - the conflict of interest always astounds me) and then paying a fortune for a bespoke solution that may not really be delivered on time or on budget. One person added to the mix isn't going to change that. So let's park the inward facing government CIO/CTO role for the moment. What about the futurist side, the leader who can report on trends and issues before they become apparent. Someone who can say "blockchain is overhyped, don't fret" but also point out that online voting is something that will require careful thought before implementation. Someone who can both champion and rein in technology's advances. Someone who can speak truth to power, and tell government ministers they're wasting the public's money before a project kicks off, and call others to account for not seeing the writing on the wall. I still feel that role is important and until we deliver a parliament of politicians who can and do understand the way technology works, what it's good for and what it should be kept away from, then this role will be needed. Someone's got to lead them by the nose and point them at the obvious. But that will require a complete overhaul of the current job description. It will require staff and resource to build a team not unlike that which the Chief Science Advisor has, with the ability to decide on a workplan and to engage with industry and the wider public to make it happen. Much better to deliver a result like that than push one person out into traffic and expect them to cope. What happens next will largely depend on Chris Hipkins and his caucus's willingness to roll up their sleeves and revisit this situation. Meanwhile, the clock is ticking and the world is moving forward. Any window of opportunity we may have to become a leading light is rapidly closing and we have only ourselves to blame. We continue to stand on the cusp of a new and golden era, but we stand while others dive in and that's a crying shame.